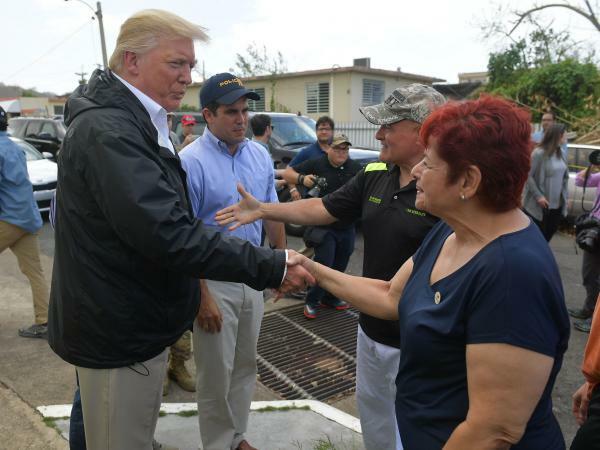 President Trump visits residents of Puerto Rico affected by Hurricane Maria last October. The president has been criticized for questioning the death toll from that storm while the U.S. mainland prepared for Hurricane Florence last week. There are two things we expect of a president in times such as these. We expect the modern chief executive and his vast governmental structure to organize and oversee the myriad tasks of relief. Emergency evacuations. Food and water supplies. Medical care. Rebuilding and restoration. We expect this to be done with the speed and efficiency we would want and demand if we were among the victims ourselves. And even though most of the actual work will be done by state and local authorities and armies of volunteers, we expect Washington to be engaged — and we hold the feds accountable if they are not. But we also want more. We want someone to address the wider emotional impact of the disaster — an impact felt far beyond the epicenter. We want someone to organize our grief for us, rally our spirits and begin the process of healing. Who better to do this than the president? At such a moment, the nation's notional pater familias is called upon to ease some of the pain and anxiety by capturing and channeling the sympathy of the nation as a whole. It is not an easy task for any president, and it is not the forte of our current president. While his visits to Houston and Florida after last year's hurricanes were welcome and well-received, they also had moments of awkwardness. So did his brief visit to Puerto Rico after two hurricanes struck that island. But the latter episode, brought to mind all too often by video of Trump tossing rolls of paper towels to a crowd, has become a sore point for the president in recent days. Even as Hurricane Florence roared in and the coastline cowered, Trump turned to Twitter to insist the Puerto Rico relief had been flawless and the death toll minimal. He denounced academic studies linking the storms to 3,000 deaths on the island, falsely claiming the reports were politically motivated. The back and forth over the number of dead in Puerto Rico was a distraction as the winds were rising in the Carolinas, but it was also a reminder of the disparity in presidential attitude toward last year's hurricanes. Puerto Rico is a U.S. territory and its inhabitants are U.S. citizens, but they do not have a voting representative in Congress and they have no say in the presidential election. The contrast with the president's solicitous treatment of politically potent Texas and Florida was unmistakable. He seemed to hold the Spanish-speaking Americans on the island at a certain distance, feuding with a mayor and making implausible claims. It tainted his response at the time and makes his current attempts to minimize the loss of life that much more cringe-worthy. But in fairness, public shows of empathy are not Trump's métier. The president has a talent for bonding with rally audiences and a flair for arousing political passion. It is far less comfortable for him to acknowledge the sorrowful details of a tragedy. He has made an effort. He went to Las Vegas to memorialize the victims of a horrendous sniper ambush. He went to Broward County, Fla., after the high school shooting in Parkland. He met with victims and their families. But he has also had moments when the tone or tenor of his remarks has raised eyebrows. Not long after taking office, he attended a ceremony honoring CIA operatives killed in action. And while he praised them as heroes, standing in front of a wall of nameless stars memorializing the dead, he veered into bragging about his election, the size of the crowd at his inauguration and the number of votes he might have received from people in the room. No president finds these moments easy, but some presidents have met the challenge better than others. Call it a gift, or an inclination to empathy. Either way, it does not seem to be among our current president's gifts. So he is bound to suffer by comparison to recent presidents who have built much of their reputations on such moments. Those old enough to remember will always recall how Ronald Reagan addressed the nation after seven astronauts were lost in the explosion of the space shuttle Challenger 1986. Reagan's stirring tribute to the crew and reaffirmation of their valor and values was a testament to the skills of the "Great Communicator" (and made the reputation of speechwriter Peggy Noonan). It became the standard to meet for all presidential responses that came after, and it popularized the notion of the president as "consoler-in-chief." Bill Clinton's finest moment in the role may have come at the service for those killed in the Alfred P. Murrah Federal Building bombing in Oklahoma City in 1995. Clinton seemed as aggrieved as a family member. "Let us let our own children know that we will stand against the forces of fear," he said. "In the face of death, let us honor life." And while rarely regarded as a great communicator, George W. Bush had an unforgettable moment on the rubble of the World Trade Center. With the ruins still smoking around him, he took a bullhorn to address the rescue workers and the nation. "I can hear you, the rest of the world hears you, and the people who knocked these buildings down will hear all of us soon," Bush said. It was hardly a speech, but it fulfilled the needs of an overpowering moment. Sadly, Bush was not as responsive when Hurricane Katrina devastated New Orleans in 2005. His initial failure to comprehend the scope of the crisis or the breakdowns in the government's relief work overshadowed his later efforts to play the consoler. While President Barack Obama did not have a hurricane of that magnitude, he got high marks for his response to Superstorm Sandy in 2012, a catastrophic episode for parts of the Northeast. Yet his shining hours of consolation came in a succession of funeral eulogies, including for the victims of shootings in Tucson, Ariz.; Aurora, Colo.; Newtown, Conn.; and Charleston, S.C. In the summer of 2016, when five police officers in Dallas were killed by a sniper at a protest, the president played the leader at a funeral fraught with racial tension. "The deepest fault lines of our democracy have suddenly been exposed, perhaps even widened," Obama told the mourners, many openly weeping. "It's hard not to think sometimes that the center won't hold and things will get worse. I understand how Americans are feeling. "But Dallas, I'm here to say we must reject such despair. I'm here to insist we're not as divided as we seem." Perhaps the past presidents whose moments of consolation were most prized were just the best speakers. Or perhaps they somehow managed to embody both the heartbreak and the determination of those feeling these national tragedies most directly and personally. Call it a gift, or an inclination. It might also be a human ability that can be learned. This week gives President Trump another opportunity to enlarge this part of his public persona. And there will likely be more opportunities to come.